Although it may come as a surprise to those who consider heavy fashion discussion to be the purview of women's attire, men's square-toe dress shoes are the subject of serious controversy among males serious about fashion and footwear. Some people love them and swear by them, while others declare them an absolute abomination. Ultimately, it's up to the individual to decide what's worthy of the purchase and the wear. The sad fact is most men don't have a lot of opportunities to wear dress shoes. If a man is only going to purchase one or two pairs of dress shoes - he should at least have one pair in black and another lighter pair suitable for outdoor or summer events - he is probably going to opt for either the classic round toe or, if he likes a bit of quirk, a pointy toe. Men's shoes are generally not the focal point of a black-tie affair, and when they are, it's because the man in question is wearing something unusual. Actors like Johnny Depp and Samuel L. Jackson are likely to finish off their evening wear with something wild, like suede shoes in blue or purple, or even an animal pattern. It gives the fashion journalists a lot to discuss, but for men who are known to walk slightly on the wild side in their dress, it's acceptable and even desired. However, the only time you will see square toes in such circumstances is if the man in question is wearing something like cowboy boots. Obviously, these are not standard evening dress shoes, but a certain kind of man can get away with them. Most men who are serious about shoes agree that men's square-toe dress shoes are in fact, not acceptable for dressing up, even if you are going for a non-classic look. If that's the case, then a pointy-toe shoe, such as the sort often purveyed by Italian designers, is a better option. 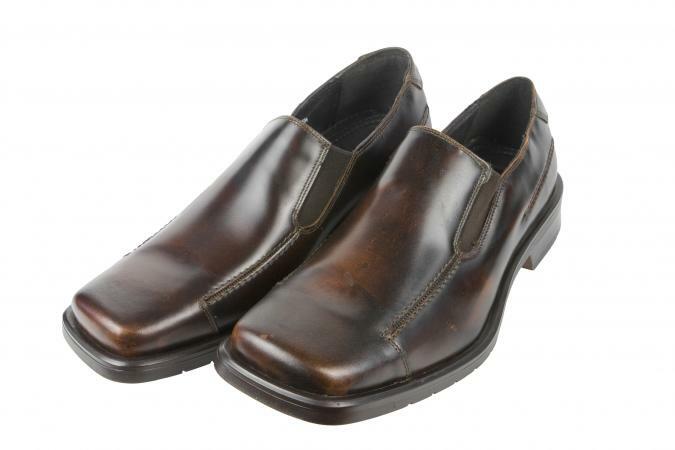 A square-toe shoe can work with jeans for a more casual look, but not for a real evening out, or for serious business. It should be noted that many men mistakenly refer to a chisel-toe shoe as a square-toe shoe. Men who insist they have smart men's square-toe dress shoes are often referring to chisel-toe shoes. The stylish chisel-toe shoe or boot starts to round at the toe but has lightly defined corners - not sharp, like a square shoe, but decidedly not a truly round toe. The square-toe shoe is much wider with sharp corners that are actually square. It is rare in fashion and if you want to see why, look through photos of men's vintage shoes. These shoes can make feet look wide and flat. While they are occasionally reclaimed and worn by retro hipsters, it is more to make a statement - sometimes ironic - rather than to genuinely look well-shod. Truly square-toe shoes were trendy among some men in the late 1980s and early 1990s, but were generally laughed at. They were considered the favorite of men who wanted to be fashion forward but really weren't. Unfortunately, the perception held and the square toes are still seen, usually in less fine shoe stores and on men who don't know what great fashion is. Square toes are considered acceptable on cowboy boots, although even here a pointy toe is preferable. The best way to avoid shoes that are considered cheap and tacky is to go to a better quality shop. When you make an investment in really fine shoes, they will last for years and always be in style, so they turn out to be a bargain and you know you will always be putting your best foot forward.